Beers from the Plamers range. My pint of Copper was fine Knowledgeable barmaid, talked a few other customers through the beer range. Seems to have been a few drivers in, as the low gravity beers were going well.. Food was interesting especially the Porky ploughmans and Shandy Chicas cheesy chips with pulled pork was huge. Could do with a with a bit of doing up, as was starting to look a bit scruffy, bit otherwise well worth a visit. This pub betrays its origins as a hotel as the main lounge area has a transitory, beige feel. Ales were from the Palmers and a pint of 200 was especially well kept. A good location at the foot of the hill and near to the museum and guildhall and historically significant but could probably do with livening up a bit – restoring a more traditional feel might work. A fair sized pub right in the heart of Lyme Regis, this was surprisingly quiet on a recent midweek evening in July, when I would have thought there would be plenty of tourists around. Besides a few locals propping up the bar, we were pretty much the only people in there. The main bar is carpeted throughout, has natural wood beams on the ceiling and a mixture of cream and maroon paintwork on the walls, with wood panelling lower down, but somehow doesn�t actually feel that pubby, perhaps due to the seating which was high backed upright leather chocolate coloured chairs like you might get in a trendy restaurant along with light wood tables. There were several photographs on the wall, many of the local coastguard helicopter and some water colours of local scenes that were for sale. We didn�t eat, although the food menu looked to be a fairly typical pub grub affair and was divided in to sections such as jacket potatoes, sandwiches, platters, etc., as well as a few meat and fish dishes with most of the mains being around the �9 mark. Ciders were all from Palmer�s, with their 200, Best and Copper Ale. The solitary cider was Thatcher�s Gold. Overall I was a bit disappointed with this pub, feeling it lacked much in the way of any atmosphere and preferred some of the other nearby options. True. 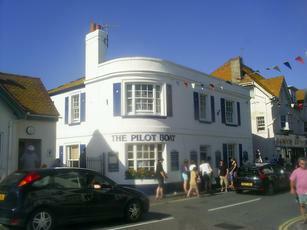 Nice pub but it serves some seriously cracking food. Loved the gurnard. All the guys ate well. Dr Phil recommends the cheesecake. We tried the Palmers 200 and the Best Bitter / IPA. Both had been kept well, tasted as good as they looked. Stuck with the Best Bitter - consistently good. Neither was an average pint. Would definitely return. Its no session pub - but excellent service.